IPCO solid steel belts are an essential component in the vulcanizing/curing of rubber sheet, conveyor belts, floor panels, printing boards, boat material and other rubber products. The belts are also used in Rotocure presses for laminating thin particle boards with decorative film, and for other board applications. 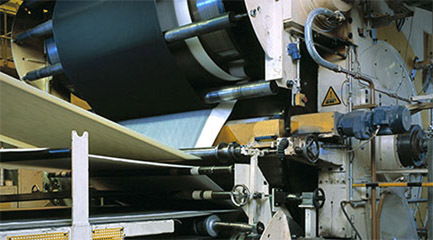 Continuous vulcanising of rubber sheets and conveyor belts. While rubber-covered wire mesh belts are still used for certain applications (e.g. ultra-thin products), solid steel belts offer a range of advantages for materials with a thickness ≥2 mm and on systems where heat is delivered from both sides, i.e. a heated drum in combination with radiated heat delivered by the steel belt. As the quality of the belt is reflected, quite literally, in the quality of end product, surface finish is critical and we can deliver to any specification, down to 0.1 μm. Our experience in supplying original and replacement steel belts for continuous rotating vulcanizing presses means we have the know-how and technology to produce belts to virtually any specification, and can supply them either ‘open’, coiled for on-site welding, or in pre-welded and ground ‘endless’ form. The smooth hard surface, unparalleled durability and excellent thermal properties of IPCO steel belts make them ideally suited to applications across the rubber manufacturing and processing industries. Conveying incl. drums, tensioning systems etc.